Sitting with a therapist was one of the hardest things we've had to do, and sometimes we left feeling more angry than when we arrived. But week after week, we went, spending money we thought we needed for 'more important' things, and slowly we started to understand the ways we needed to work together. Both ready to keep working at our marriage, we tentatively moved forward. And in a twist to the story of our imperfect marriage, we unintentionally found ways to create our own therapy sessions. 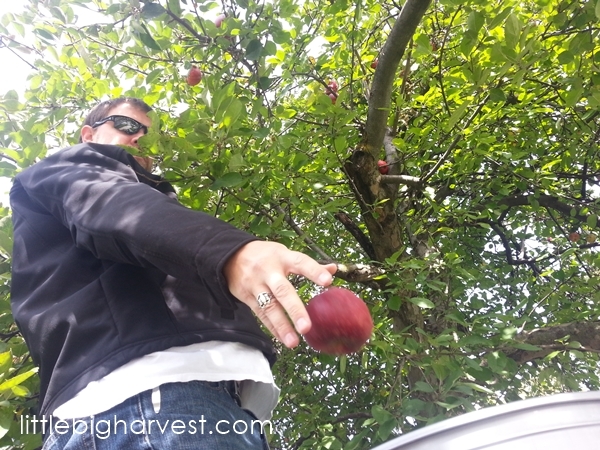 Apple picking. Urban foraging. My desire for apples, since Uncle Loren's produced none this year, and my husband's willingness to go along with almost any hair-brained idea I come up with. It all came together and brought Craig and I closer than we've felt in months. My eyes had been trained on a trio of trees that I pass by nearly every day on my way to drop off kids at school. The red globes seemed to call to me, bright and luscious, more of them falling to the ground and street each day. I cringed when I saw all the smashed apples on the street, cars driving over them. It was obvious that no one had taken interest in picking these apples, and as I passed them by, day after day, I envisioned my trusty 5-gallon buckets filled up to the brim. On some of my drive-bys I would quickly scan the house (well, as safely as possible when passing by at 25 miles per hour), looking for signs of life; people in the yard, a lone figure on the porch, perhaps. The house, large and brick and beautiful, seemed intimidating, a formidable behemoth, a dragon I wanted to learn to slay. Drama! It's only apples, right? It might be important to explain here that at the heart of it, I'm an extreme introvert. Despite the very hard work I put into appearing bubbly and friendly and unafraid of strangers, the truth is, I've retained much of the painful shyness that held me back in childhood. As I've aged I've learned that being a hermit will not help me connect with people and experiences that I truly do want, desperately, in my life. I missed out on a lot of things throughout my younger years due to being an introvert. Knocking on the doors of complete strangers is not an activity I ever seek out. (trying to sell popcorn with one of my boys for Cubscouts a few years ago nearly killed me). Except, here's the thing. I really wanted those apples. Needed them, even. I've gained an independence from store bought applesauce because of my apple-picking (we use applesauce for many things in our household). I saved money making applesauce. I had provided something for my family for little money, and with no pesticides or extra ingredients, despite living on a tiny lot in the suburbs. Even though we don't own acres or a 'real' homestead, and probably never will, I had succeeded at that one little thing. Wanting and doing are very different things, and one of my biggest faults is dreaming and planning...and then never doing. Enter my husband. My partner, my best friend, and at times, my nemesis. I'm an introvert, he's an extrovert. We are so different in so many of the most fundamental ways. Ours is far from the 'perfect marriage', and by far from perfect I mean miles away. You know those couples who just seem to belong together? Who age together gracefully and always seem at peace, who have the silent happy smiles and eyes for each other, who are just pleasant to be around when they are happily being a couple? Yeah, that's not me and Craig. We bicker. We scowl. We ignore, There have been times in our 17 years together that, to be brutally honest, it may have been better to just move on. But one of the characteristics that we share, to a fault, is incredible stubbornness. We hang in, we rough it out, we harbor bitterness and anger and resentment for sometimes months at a time. Then a good phase will come rolling in again, predictably, in our never-ending series of high and low tides. Though at times I long for one, long, uninterrupted beach, with no tides at all, it's not our reality. In the high tides, in those wonderfully blissful times, we rediscover what it is we have always loved about the other. As we get older, we find ways to move out of the low tides as quickly as possible, and to stop harboring the anger for so long, because it's tiring and pointless. We've learned to try to focus on the traits we adore or admire about the other person instead of fixating on those inevitable faults. Unearthing the traits I love about my husband takes me by surprise every time. Today, we foraged together, a completely unplanned and spontaneous event, and it was better than therapy (which, by the way, if you can afford to, GO to marriage therapy. In our experience, it's worth every penny and hour spent). I admired my husband today, for a few reasons. For one, he doesn't know a stranger. He seems to have no fear of talking to just about anyone. Secondly, he supports all my ideas and dreams, no matter how crazy. I wish I could return that enthusiasm for all of HIS ideas. The fact is, he's a fearless optimist, and I'm a skeptical pessimist, looking for all the ways that an idea could fail. Some of the ideas I'm talking about really are risky--his desire to jump into real estate, my desire to buy up empty lots and turn them into thriving urban gardens. Those are the scary ideas. Apple-foraging? Come on, now...what risk is there? In my eyes, the risk was there...the risk of looking dumb. Of hearing the words "no". I have all the motivation in the world to do something until I draw a blank at the options I'm not prepared for, like someone saying no. After all my weeks of wondering, dreaming, and fearing, Craig made the decision quickly and painlessly, like pulling a bandaid off tender skin. I tentatively asked if we might go and forage some apples. Craig didn't even hesitate. Within 5 minutes we had grabbed and loaded our ladder and some buckets, and were on our way. I had to laugh at how simple my husband makes everything--no second thoughts. My heart soared, ready for the adventure, and excited to be doing something that meant so much to me with the person I love most in this world. 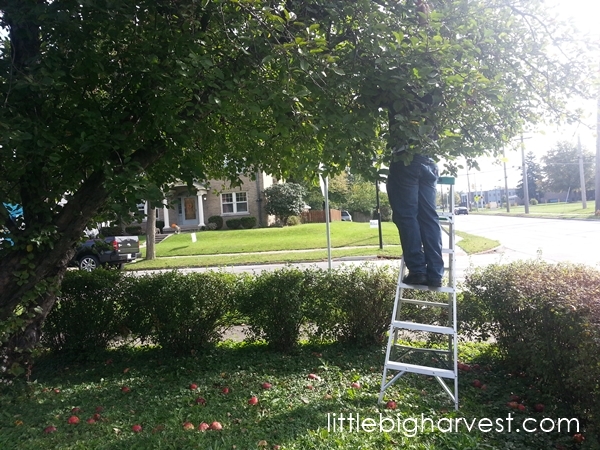 The owner of the house said SURE, but teased us a bit, and we got some strange looks from passers-by as we laughed, awkwardly climbing the ladder (those apples are so much higher than they first appear!). 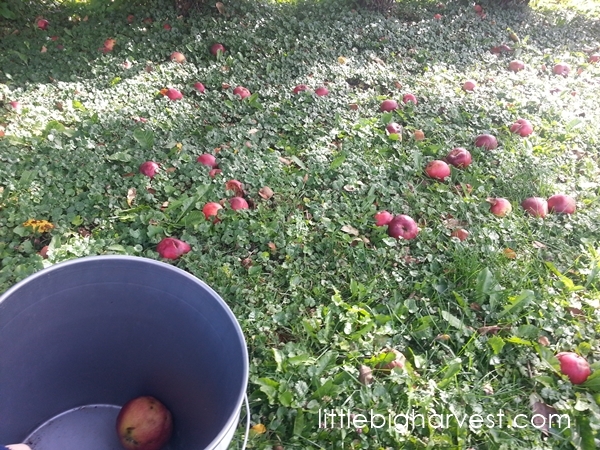 After just a little while, it was no longer about the apples at all. They weren't even as great as I thought they'd be..many of them were squishy and filled with holes. It didn't matter, we'd get enough good ones for sauce. 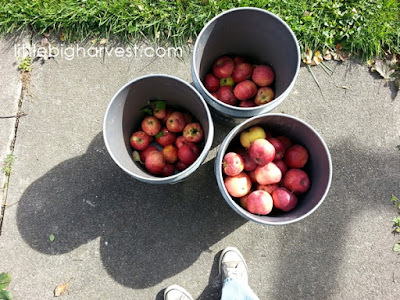 What mattered the most in that hour of apple picking on a stranger's lot was that a husband and wife did something together, laughed, smiled, and felt a much-needed sense of togetherness. The applesauce will taste especially good this year. As we continue to weather the storms that will inevitably come, this afternoon will fill my heart with a warmth and light that will help me remember why we got married in the first place--because we love and enjoy each other, and in the end, always seem to fill in for the other is lacking.